Like many people who see 11:11 and love facts and figures, I’m a ‘flipper’. My life used to rely on me being left-brained and logical (I have a Science degree and worked in Government and for NGO), before a number of crises (including breakups, the 2004 tsunami and an eating disorder) led me to developing my right-brained, intuitive side. Nowadays, I blend practicality with mysticism to help people to break down their fears and express their true colours. 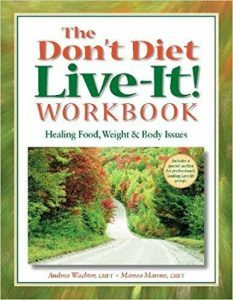 One of the books we used in group therapy, The Don’t Diet Live-It! Workbook (see photo) by Andrea Wachter and Marsea Marcus talks about moving from black-and-white thinking to rainbow/ spectrum thinking. I love this analogy. It’s been a long journey going from total disbelief of intuition (my inner teacher or tuition) to a teacher of manifestation. Only after delivering 3,000 psychic readings and 50+ workshops, have I accepted that we are Souls with free will, who choose our families, lifepath and Soulmates, including our children. Coming to Earth is like taking a working holiday, with free periods for excursions and dinner dates. There is conflicting information online, about autism being caused by brain damage, genetics, bad parenting, medical choices etc. See this post These 8 Things Don’t Cause Autism. I don’t believe there is one trigger, however there are likely to be common therapies, choices and environments which can help autistic people to thrive. 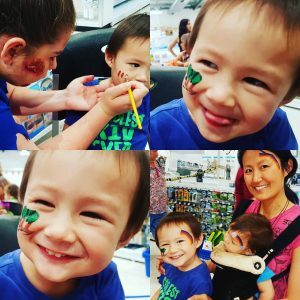 As my friend Vicki Haspels (another psychic) says, ‘what if autistic kids are the new humans?’ I say, ‘autistic, or artistic’ – who really knows? Perhaps, some Souls incarnate, wanting to experience Asperger’s/ ASD from birth to learn certain lessons or to educate their family and community, while others develop it? There are a few people in my family with autistic tendencies and/ or anorexia, and many of us work as teachers, lecturers and in the public service. Some people say that all of us are on the spectrum. Numerous famous people are thought to have had, or have Asperger’s syndrome. I was stunned to see Mozart on this Babble list of famous people with autism, as I share a birthday (27 Jan), love of piano music and lifepath (29/11) with him. This post also mentions Mozart, and how he would become sick from loud noises. Albert Einstein, Andy Warhol, Bill Gates, Daryl Hannah and Hannah Gadsby (also a 29/11 lifepath) are others who may have, or do have autism. I’ve seen a connection between multiple Master Numbers (11/ 22/ 33/ 44) in someone’s chart and autistic traits/ gifts/ intense specialisation. 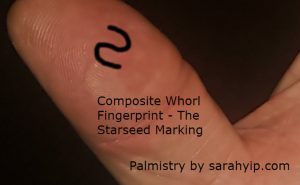 I mentioned this in Part 1 as part of the discussion on Composite Whorl fingerprints, which can be an 11:11 Starseed marking (see photo). I love numerology because it gives us the essence of things. I think of it as mathematics with the magic still included (i.e. mathe-magics). All words, names and addresses have a vibration in numerology – see the system I use. The Destiny number (sum of consonants and vowels) reveals their outer impact, while the Soul Urge number (sum of vowels, including Y if it appears alone, e.g. Happy, Lullaby) reveals their inner impact. = A 86/14/5 Destiny or a 14 Karmic Debt Number in numerology. 14 energy is about finding the middle path of moderation instead of being too rigid or reckless. It’s about the wise use of ‘4’ or Heart Chakra Energy (love and compassion) to create more ‘5’ or Throat Chakra Energy (truth and freedom) on the planet. 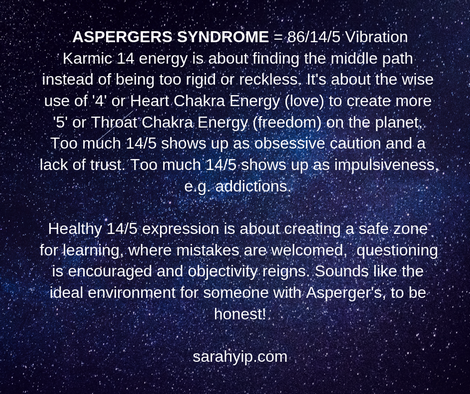 Too much 14/5 shows up as obsessive caution and a lack of trust. Too much 14/5 shows up as impulsiveness, e.g. addictions* and burning the candle at both ends. Healthy 14/5 expression is about creating a safe zone for learning, where mistakes are welcomed, questioning is encouraged and objectivity reigns. Sounds like the ideal environment for someone with Asperger’s, to be honest. Tania Gabrielle also links 14/5 to a life in the spotlight and media potential. Adding the vowels (including Y), the phrase has a 29/11/2 Soul Urge, so it activates our inner Spiritual Messenger, and sense of justice. Words like WISDOM, FIRE, LIGHT and RICH have a 29/11/2 numerology. 5 and 11 energies are futuristic, humanitarian and androgynous. 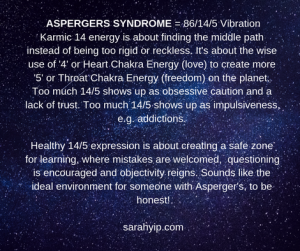 These are qualities that I associate with Asperger’s people, Starseeds and myself. Can you relate? =A 101/2 Destiny in numerology, which is about Sacral/ Second Chakra Healing, i.e. being a peacemaker, balance, conflict resolution, healthy relationships and emotional flow. The word AUTISM also has a 20/2 numerology – so it is about blending polar opposites. Adding the vowels, the phrase has a 41/5 Soul Urge, so it can heal our internal Yin-Yang or male-female energies. 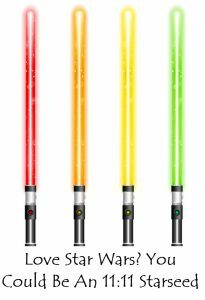 I’m laughing slightly because 41/5 is the vibration of Jedi Master and I found some great posts on Star Wars and autism. No surprise, I have previously blogged about Star Wars and Pokemon numerology. Some researchers say that women with ASD have extreme male brains. I don’t agree, and neither does the author of this Forbes post. I believe I have high female hormones and a feminised brain. Again, it feels like clickbait-ing when people boil autism down to labels like this. I believe that autistic people can be wonderful healers and feelers, with support and encouragement. See this article from The Cut, about an autistic man who went from being ‘socially blind’ to emotionally available/ overwhelmed after magnetic brain stimulation. I can relate. Sometimes I have high pain tolerance (which helped with birthing my sons and launching this business), at other times I cry from a paper cut or can’t have people touch me because then I know their life history. That’s why I closed my office for a while when I was pregnant. I found that doing phone psychic readings resulted in less transference. As mentioned in Part 1 of this post, learning that anorexia is the ‘female Asperger’s’ (see this article) gave me shivers of recognition. Maybe that’s why I’m still prone to skipping meals when stressed. They say that you eat the way you live – your appetite for life is your appetite for food. When I feel blocked or stuck in life, I get anxious and feel like disappearing – being a shrinking violet – hiding from the world. This cycle of under-eating leads to insomnia and workaholism, which leads to constipation and stomachaches, which leads to under-eating, and then I’m back in my pattern again. Since then, I’ve seen this formation in other client’s hands. Often they mention eating on the run, chronic indigestion (which can relate to under-chewing food), and/ or a habit of dieting or selective eating. For the palmistry fans, the pattern is in the centre of the hand. It’s a series of fine, upwards lines which flare up to the Apollo/ Ring and Mercury/ Pinky fingers. These lines are not to be confused with the Sun or Apollo lines, which indicate an open Third Eye Chakra. Sun Lines are more vertical, defined and usually appear higher in the hand, below the fingers. 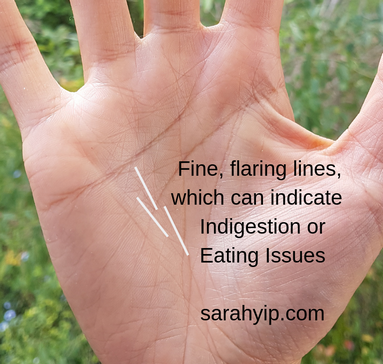 If you are confused, consider studying palmistry with me, as it’s easier to learn in person. FYI I write about the spiritual meaning of food intolerances in this older post. Although I’m conscious of my appearance, and my family certainly valued thinness, I never felt my eating disorder was about being skinny. It was more about ‘not feeling at all’ and avoiding being seen. There was also a fear of giving birth, becoming a mother and losing my identity, which fortunately has not happened – my kids are 100% delightful (see this photo of us getting face painted)! Discovering the Asperger’s connection has transformed my view of anorexia. It’s opened my mind to new forms of self-care and online communities like Autistic Not Weird by Chris Bonnello. Is there a connection between Asperger’s and Psychic Ability? To quote Tony, “Having a very sensitive sensory system, for example hearing sounds inaudible to others and an emotional ‘sixth sense’ can lead to an interest in the supernatural which could also be misinterpreted as a sign of not being in touch with reality. Who knows, if I had seen a doctor when I started seeing repeating numbers like 11:11 in 2011, I might have been treated for mental illness or schizophrenia (as per my post on Composite Whorl fingerprints). However, since I was broke at the time, didn’t trust authority, knew I wasn’t crazy (given I’d worked for a decade in high level roles) and was surrounded by people who were alternative healers, I plunged into my calling instead. I also met my 11:11 Soulmate Kris Anderson, now my husband in 2012. That’s him with my crystal healer friend Deniz Akan in the photo. 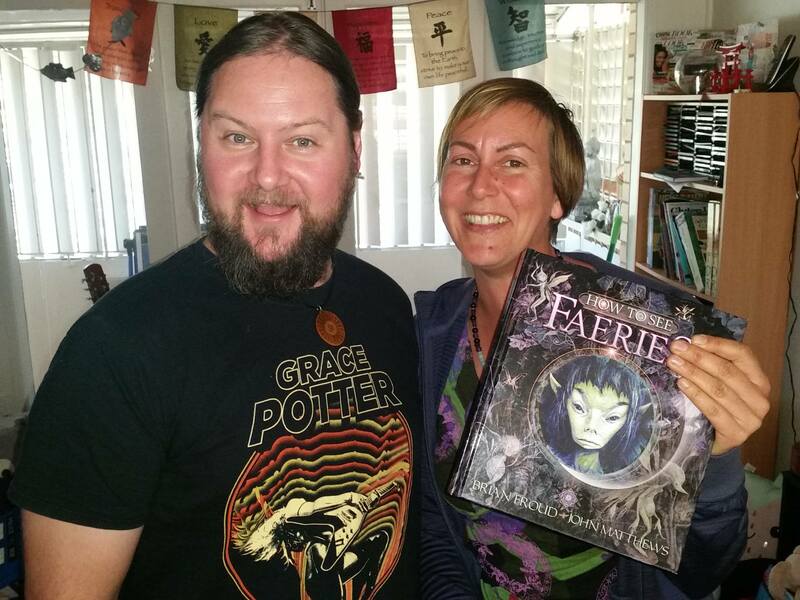 Kris helped me to overcome anorexia (by cooking for me) and has many lifetimes of occult knowledge. 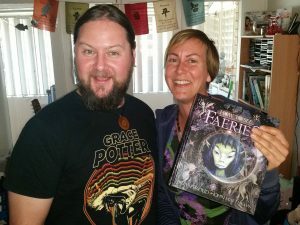 Not only did we meet at my first palmistry talk (see the video), I knew he was the one, after he helped remove a negative entity I picked up while Astral travelling. You don’t find guys like that often! If this topic intrigues you, check out Tania Marshall’s site. She writes that Asperger’s Women may display, “High sensitivity, may not be able to listen to or watch the news, listen to the radio, read the newspaper, watch violent shows/movies or horror movies, see hurt or injured animals, abuse, war, trauma, are sensitive to the emotions and “emotional atmosphere” of the environment, experience referred emotion and psychic “6th sense” abilities, may have strong intuitive and/or psychic abilities” Spot on. Hello beautiful. There’s something you need to know. Life doesn’t end at 15, like you think. You’re going to live at least three more decades and have such an adventure. Sure, there will be upsets. Your family are going to teach you so much about letting go. You won’t learn to hug until you’re 20. And you’ll fill hundreds of notebooks before having the courage to publish anything. You’ll want to quit, so many times before you find the yellow brick road, but please don’t. Because a funny thing will happen on the way to the forum. You’ll meet thousands of strangers who get you. You’ll cure your fear of the dark, ghosts, heights – all of it. And most of all, you’ll meet your Soulmate, have the cutest babies ever and turn into the swan you always thought you were inside. I hope you’ve found some answers in this series of blog posts. The biggest message today is to love your quirks. Easy things for normal people (aka neuro-typicals or NTs) are hard for me – I burn toast, struggle with time and budgeting, get locked in toilets and panic about crossing the road. Yet hard things for normal people are easy for me – I can predict trends, talk to Spirits, love public speaking, have a photographic memory and am comfortable asking famous people like Anna Bligh, Nat Cook and Liz Gilbert to show me their palmistry! Asperger’s in women is often misdiagnosed as we learn to cover it up (plus people don’t expect us to have it). That’s sad as it means many of us are suffering without needing to. I have spent thousands of hours beating myself up over my weaknesses, but as soon as I read about Asperger’s I felt this surge of self-love. Like, I am not broken, just differently brilliant. They say, smooth waters do not make for skilful sailors. Maybe that’s why I became a life guide, psychic reader and Holistic counsellor, because I’ve survived so many tsunamis? People find me when they’re ready for a leap of faith, and looking at how many times I’ve failed, I can see why. -As soon as I made the connection with Asperger’s, someone booked for a reading saying they had seen my anorexia article. Whoa!! -Forrest kept saying Bubble, Bubble after my discovery, and forced me to blow bubbles with him. Then I saw a video on Youtube about Ryan Judd, a music therapist, blows bubbles to make autistic students feel comfortable. -Asperger’s people often have insomnia. When I began writing this post, Forrest dragged all the pillows into his cot, reminding me of my favourite pastime as a child – hiding under heavy quilts. Weighted blankets are now a known therapy for autistic adults and kids. -I knew Naomi Berg from Purple Skirt was special because my favourite item of clothing as a child was a purple skirt. It was my costume for an eisteddfod set to the song ‘Happy House‘, about a dysfunctional family. -As soon as I Googled Asperger’s, I kept finding matches for my life history. I saw a post about someone’s Dad who had an orchid obsession (so does mine – some people compare highly sensitive people to orchids, who need ‘greenhouses’ to thrive). I also saw an article about a Aspie girl who hugged chickens for therapy (something I did in high school, as we had a farm) and so on. What a Man with a Knife, Taught Me About Life – Asperger’s women can get into difficult situations due to their trusting natures.